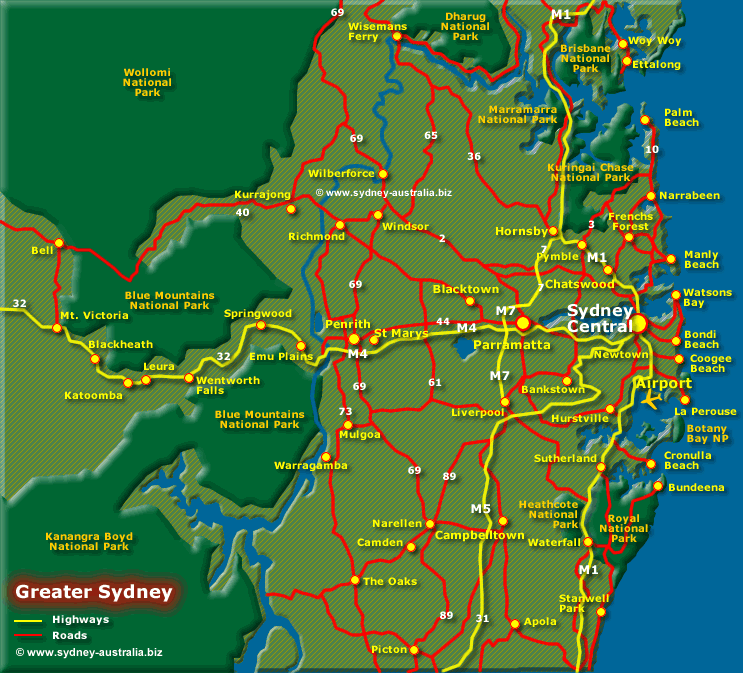 Greater Sydney map showing major arteries. Suburbs and places to go include Sydney Airport, Newtown, Blackheath, Katoomba, Richmond, Windsor, Gosford, Wollongong, Hornsby, Bondi Beach, Manly Beach, Palm Beach, Chatswood, Parramatta and Cronulla. Also shows surrounds, including the Blue Mountains National Park, The Entrance on the Central Coast and to the south east, the Royal National Park. The Blue Mountains have been a nearby Sydney Getaway for many years for Sydney-siders, nowadays, international visitors also go to see the views, history, flora and fauna of these ancient mountains. The population of Sydney passed the 4 million mark, more than half the New South Wales population. It would be difficult to name an ethnic group not included in that number. The North Coast, ever popular, is becoming more so but so is the Hunter Valley and the Blue Mountains. To the immediate north, nearby Central Coast and just south of Sydney Regions are well worth visiting, they all have their own charms. Find small fishing villages with the freshest of seafood in the restaurants and markets, historical townships and stunning national parks.